Sabetha opened the season with quality road wins against Centralia (28-6) and Holton (21-0), squads that eventually reached the quarterfinals in their respective classifications. The Big 7 Conference victory versus Holton marked the first time the Wildcats had suffered a home shutout in coach Brooks Barta’s 21 years. However, the victory received little coverage. Ninth-year head coach Garrett Michael, who has spent more than two decades with the Bluejays, took notice. Eventually, it became the team’s theme in a 12-1 season that has culminated in a Class 3A state championship berth. Sabetha will face Marysville (12-1), two teams that have spent the vast majority of the fall outside of the top-5 rankings, on Saturday in Hutchinson. Start time is 1 p.m. for a pair of squads separated by just under 50 miles in northern Kansas on Highway 36. Sabetha, with its traditional run-heavy offense, has made the playoffs every fall since ’07 and is 8-3, 7-5 and 9-2 the last three seasons. The Bluejays have titles in ’93 and ’97 and runner-up in ’86. Michael’s dad, Tom, was the Marysville head football coach from ’84-88. Current Marysville assistant Bert Lord was Tom Michael’s athletic director during his head coaching tenure. Current Sabetha principal Sheri Harmer spent the previous 27 years at Marysville before coming to the Bluejays in July 2014. “I really give my coaching credit, my pedagogy, my philosophy from Marysville and that time that dad was there,” Michael said. “There’s still a lot of people here in town who speak very highly of their family and of coach Michael,” Marysville coach Dustin Heuer added. Marysville has enjoyed a huge turnaround with Heuer, in his fifth year. The Bulldogs halted a 32-game losing streak with a season-opening victory in ’15. Marysville was 4-6 and 7-3 the last two years and has ridden one of most efficient passing attacks in Kansas this fall with senior quarterback Jack Blumer. In the spread, Blumer has completed 189 of 273 passes for 2,940 yards and 30 scores. He has rushed 110 times for a team-high 913 yards and 14 scores. Sophomore Atreyau Hornbeak has emerged with 160 carries for 850 yards and 20 TDs. Senior Gabe Pieschl (52 catches for 1,205 yards and 13 scores) and junior Jacob Backhus (68-814-7) are the top receivers. Additionally, Dustin’s brother, Matt, the Hanover head coach, qualified the Wildcats for the Eight-Man, Division II state title game. 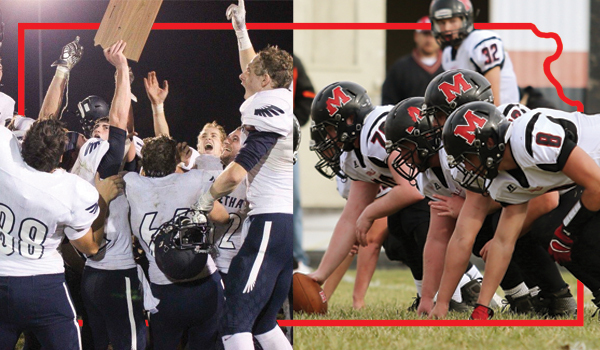 Marysville is 0-2 all-time in state titles with losses coming in ’90 and ’09. Last season, Marysville had Hunter Warnick (1,398 yards, 16 TDs) in the backfield. Junior Derek Roever was supposed to take over as the main back before fought some ankle issues early. Hornbeak has emerged, especially in the second half of the year. Last week, Hornbeak had three touchdowns, including the game-winner with 3 minutes, 32 seconds left. The line has featured veteran returning seniors Seth Mooradian and Bryson Meinhardt on the line. Seniors Nick Sparks and Patrick Linck, junior Levi Nordhus and sophomore Lane Johnson-Martinez have played solidly up front. The Bulldogs have an average score of 42-19. In Week 3, Sabetha played Jefferson West, which opened 2-0 behind freshman quarterback Cade Ross. In Week 2, Ross threw for a school record 340 yards and five scores against Riverside, a performance that received acclaim. In Week 3, Sabetha beat Jeff West, 22-7. “I didn’t make a big deal of it, but I made sure the kids knew that ‘Hey, I like this, all the spotlight is on everybody else,’” Michael said. In Week 5, Sabetha played Perry-Lecompton in a battle of undefeated teams. The Kaws had tallied 63 points a game in the first month, and Michael said local coverage heavily focused on the Kaws. Sabetha, with little recognition, defeated Perry-Lecompton, 28-21. After a 6-0 start, the Bluejays fell in a high-profile district matchup, 21-7, at Nemaha Central, then ranked No. 1 in the classification. In the second round of the playoffs, Sabetha again faced Perry-Lecompton. The Bluejays won 28-6 and set a state record for team carries in a game. Sabetha’s smash-mouth attack finished with 88 rushes for 440 yards, breaking the state mark of 77 set by Holton in 1999. “Didn’t even know it, weren’t even trying for it,” Michael said of the record. The following week, Sabetha tallied 83 carries for 611 yards in a 56-13 win versus Osage City. Sabetha averages 341 rushing yards and 35 passing yards a contest. From ’16, the Bluejays graduated its pair of 1,350-yard backs with Blake Plattner and Trae Snyder. The duo never fumbled in ’16 and helped the Bluejays average 44.7 points a contest. This year, Sabetha has collected 40.3 points a game. The Bluejays returned just two offensive starters but senior starting center Tanner Uklele broke his wrist and missed the first five contests. When Uklele returned, Sabetha moved him to left guard and kept his replacement, junior Peyton Lippert, at center. Senior right tackle Josh Compo broke his hand and missed the first six contests. Since returning, he has been a key backup on both sides of the ball. The Bluejays have been healthy since districts. Sabetha has five running backs, juniors Joe Gruber, Mason Engelken, Joel Hackney, senior Wyatt Beyer and sophomore Gabe Garber, with more than 570 yards. Gruber leads with 161 carries for 1,159 yards. Garber has a team-high 14 rushing scores, one ahead of Gruber. Last year, Sabetha had just four turnovers and was plus 15 in turnover margin. This season, Sabetha has forced 33 turnovers and stands at plus 23 in turnover margin. Senior safety Cole Oehm, a three-year starter, is the team’s leader. Oehm played middle linebacker as a sophomore, before he went to safety as a junior. This year, the 152-pound Oehm starts at defensive end, the cornerstone position in Sabetha’s unit. Junior nose guard Elliott Strahm and linebackers Garber and junior Cauy Rokey have helped the defense. Michael said Strahm doesn’t have a lot of tackles but “demands a double team, demands a triple team.” Sabetha has permitted just 10 points a contest. Last week, Sabetha beat Silver Lake, 17-14, in the semifinals, the second time in three years the Bluejays have defeated Silver Lake at home in the playoffs. Michael has also noticed that, entering last Friday, Sabetha was ranked fourth of the four remaining teams. He mentioned the Bluejays are currently second behind Marysville, and has again played the “no-name” mantra entering state.